Just in case there were any doubts left that Amazon plans to refresh its tablet and e-reader lineup next week, today the retailer announced that the Kindle Fire is officially sold out and teased that they’ve got “an exciting roadmap ahead”. The company took the opportunity to tout the Kindle Fire's success, claiming it is the #1 best-selling product in its history, and that it captured a 22% tablet share in the US within just nine months. Amazon didn’t share any sales figures to back up its claim. According to market research firm IDC, the company shipped 1.2 million Kindle Fires in the second quarter of 2012, decent enough to give it a third-place ranking in the global tablet market with a 5% share, behind Samsung and iPad juggernaut Apple. 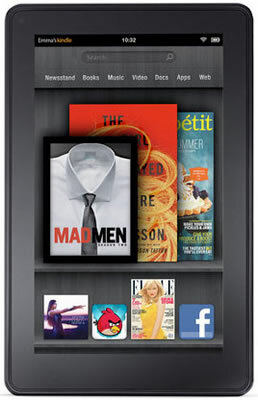 That’s not bad considering the Kindle Fire has been available only in the US since its launch in November 2011. But while the Fire clearly has picked up some traction, it certainly has a long way to go. Samsung captured a 9.6% market share during that same period and Apple had a whopping 68.2%, and that’s before the Google Nexus 7 went on sale in mid-July for just $199. Moreover, Google has already expanded international availability by launching its 7-inch Android tablet in Germany, France, and Spain earlier this month. Amazon recently sent out invitations for a press conference on September 6 at the Barker Hangar in Santa Monica, California. The company remained tight-lipped on the exact nature of the event, but rumors suggest as many as four Kindle Fire 2 variants could be revealed in 7- and 8.9-inch sizes with varying features. With the Kindle Touch completely unavailable as of a few days ago, Amazon is also expected to refresh its e-reader lineup, integrating reading lights to some models to better compete with the Nook Simple Touch.